Explainer: Why is India’s Agriculture in Crisis? In the past few years, India has seen a series of farmers’ protests across several states including Maharashtra, Madhya Pradesh, Rajasthan. Such has been the scale of discontent that 182 farmers’ organisations from all over the country have come together to form the All India Kisan Sangharsh Coordination Committee to spearhead their agitations across the country under the Kisan Mukti Yatra (Farmers Liberation Rally) banner. They have taken out three rallies mobilising the farmers to demand remunerative prices and an agriculture policy that helps farmers. The third leg in eastern India is in progress. On November 20 all farmers will gather in Delhi for a massive protest. This anger fermenting in India’s vast farming community is a direct result of increasing hardships because agriculture has become increasingly unremunerative for a vast majority of farmers, except the very big land owners. Other striking symptoms of this crisis are suicides committed by farmers over the years and the increasing abandoning of farming. The government recently admitted in the Supreme Court that in the last four years nearly 48,000 farmers took their own lives, mainly because of losses and indebtedness. 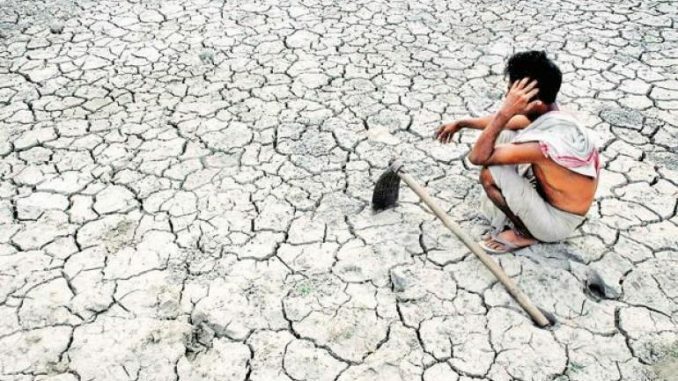 Data from the govt.’s National Crime Records Bureau (NCRB) reveals that this trend goes back several years, with nearly 2,50,000 farmers having taken their lives during 1997-2012, after which the govt. stopped giving details. Another stark symptom of the agricultural crisis is that between 2001 and 2011, nearly 9 million farmers abandoned farming, according to Census data. In the same period, the number of agricultural workers (labourers) grew by 37.5 million, an increase of 35%. All this points to the fact that there is a deep crisis affecting agriculture, which is the biggest source of employment in India and provides food for the whole country. It is a matter of deep concern for not just farmers themselves but for all Indians because ultimately it affects all of us. Back in 1951, agriculture provided nearly 70% of total employment of the country and contributed more than 51 % to the Gross Domestic Product (GDP). But 60 years later, in 2011, agriculture and allied sectors provided nearly 55% employment while its contribution to the GDP had dramatically dropped to just 14%. This means that agriculture sector is absorbing too many people in order to produce too less value. It is oversaturated with workers and farmers who are depending on ever smaller returns from it. This has happened because the growth in industrial sector that was supposed to absorb the excess population engaged in agriculture did not happen. The slow pace of industrialisation, caused by not just erroneous policies like export orientation, but also refusal of Indian capitalists to invest in heavy industrialisation and preference for the services sector are some of the reasons behind this. The neglect of the successive governments in failing to implement land reforms and not having a policy to provide alternative employment to the large population dependent on agriculture has aggravated the crisis. Another factor is the increasing fragmentation of land. In 1970-71 the average size of landholding for families dependent on agriculture was 2.28 hectares (ha). By 2010-11 Agriculture Census states that on an average only 1.15 ha of cultivable land was available per cultivator. If we look at the status of farmers belonging to SC and ST communities the situation is far worse. In 1980-81 the average land holding size for SCs was 1.15 ha which reduced to 0.8 ha in 2010-11. Similarly, for ST farmers it went down from 2.44 ha to 1.52 ha in the same period. This is one side of the picture: high number of dependants on agriculture and falling land holding size. Nearly 67 % of the farmers operate on land less than 1 ha and 18 % of farmers own between 1 – 2 ha of land that means 85 % of the farmers in India are marginal or small farmers while 0.7 % of farmers own more than 10.5 % of agricultural land. Now let us turn to the other side – how much can farmers earn from agriculture? The Committee on ‘Doubling Farmers’ Income’ headed by Ashok Dalwai had in its report estimated that in 2011 a person engaged in non-agricultural occupation earned 3.1 times more than a farmer. A person who was employed as an agricultural manual worker earned 60 percent less than a farmer. The 70th round survey report on agricultural households brought out by the National Sample Survey Office (NSSO) actually showed how grim the situation of the farmers is in the country. It has shown that the farmers’ earnings from agriculture were so low that their expenditure far surpassed their incomes. Farmers who owned or worked on land less than 1 acre earned just Rs.1308 per month from agricultural operations while his/her household’s monthly expenditure was Rs.5401. A family has to look for sources other than farming to meet the balance expense of Rs.4093. Mostly it is the private money lender who would lend the money at interest rates at high interest rates. The committee on DFI comments that people who own/operate less than 2.5 acres of land are bound to make losses. But the NSSO study had shown that even people with 5 acres of land did not earn enough from the farm to meet their monthly expenditure. They incurred a loss of 28.5 % when compared with their income and expenditure. On top of this the rising input costs have added to the burden of farmers. The DFI Committee analysed the cost benefit analysis of 23 crops grown in major states in India and concluded that the “increase in total costs” were responsible for the decline in real income from agriculture. Newsclick spoke to P.Mallaiah, a farmer based in Telangana who cultivates paddy in 5 acre of land – 3 acres of which the family owns, and 2 acres leased in as a tenant. He said that on a conservative estimate it costs around Rs 20,000 per acre to grow paddy. So to cultivate paddy on 5 acres, he would have to borrow one lakh rupees, just to meet the expenses that are needed to be paid immediately, leaving out other costs like electricity, water, tax and their own labour. This money would be borrowed from the money lender at Rs 24-36% annual interest. At the end of the day, there is nothing left with the farmer, not even the cost of the labour put by him and his wife in farming. To meet expenses, farmers borrow money either from banks or the local money lenders to sow their crops. In most cases it is the local money lenders who give the credit. According to the NSSO data more than 52% of the farmers are in a debt to a tune of Rs 47000 per household on an average. States like Andhra Pradesh and Telangana have about 93% and 89% farmers indebted to the tune of Rs 123400 and Rs 93500 respectively per household. The farmers, despite high interest rates, take the risk and cultivate only to be disheartened when their produce does not fetch suitable prices that cover their costs and leave something over as profit. Only a small portion of the farm produce gets the minimum support price (MSP) more than 90 percent of farmers are at the mercy of the traders who set the market price. Meanwhile the state has stopped supporting the farm sector. Everything has to be purchased from open market. And there is no support of extension support services as the state had discontinued or greatly reduced these after the green revolution. D.Raghunandan of Delhi Science Forum said that during the green revolution, extension services were in place and govt. officers helped farmers adopt new technologies and practices. After the discontinuation of these services, the govt. allowed multinational pesticides and seed companies to take over the responsibility of explaining everything to their own local agents who market seeds, fertilisers and pesticides. Public investment in agriculture, which drives the economy over the years has reduced drastically. The government spent 12-16% of the total Plan amount on agriculture in the year 1960-65 but by the time our country progressed to the 11th Plan in 2007, spending on agriculture has dipped to just 3.7%. Irrigation is important for increasing yields. Food and Agriculture Organisation (FAO) says that irrigation increases yields of crops by 100 to 400%. But in India out of the 140.8 million hectares of sown area nearly 78 million hectares which is 64 % of the total sown area is rainfed. This sad state of affairs is due to the neglect of the irrigation sector by the government. The Ministry of Agriculture’s own report (State of Indian Agriculture) admits that after 1990s the government neglected irrigation by reducing the funds for it. The agriculture sector can be made a profitable and sustainable sector if the government changes its current policy towards agriculture. First and foremost, land reforms should be implemented by ensuring strict adherence to land ceiling laws and redistribution of excess land among landless. Tenants should be protected by registering them and providing security of tenure. Govt. procurement should be extended to a variety of produce with minimum support prices offered. The government should invest in bringing more land under irrigation and building infrastructure. It should connect farms to markets, so that perishables produce can be transported quickly. Credit facilities should be provided to farmers, with special attention to small and marginal farmers, and SC/ST farmers. Climate change and its impact on agriculture needs to be factored while making a sustainable policy on agriculture. For that agriculture research institutes should be funded well and agriculture extension services should be strengthened.